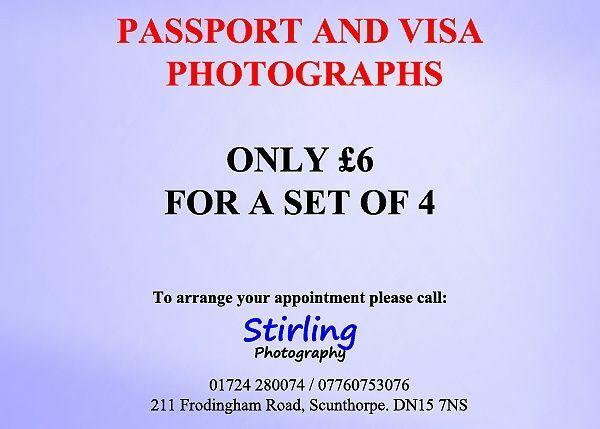 At Stirling Photography we specialise in passport photographs, having the right specifications is vital to your photographs being accepted by the Passport Office. Many Countries require visas when you visit them, here at Stirling Photography in Scunthorpe we have produced visa's for many different countries including, India, Canada, USA and Saudi Arabia. There are many reasons why you will need I.D photographs, from renewing your driving licence or disability badge to home office identification. Over the years Stirling Photography have been asked to provide photographs for them all. As the studio is busy with portraits, wedding enquiries and other peoples passport photographs it is important to contact us for an appointment.